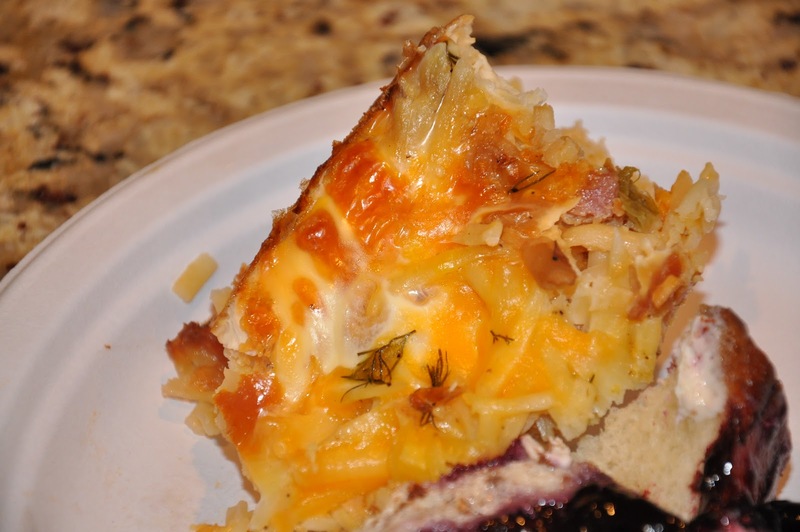 This egg casserole was a hit this weekend . . .
Spray crock pot with non stick cooking spray. Cook bacon til crisp, cool, then chop into 1/2 inch pieces, set aside. Saute onion, garlic and bell pepper for 5 minutes. Place 1/3 of frozen hash browns in the bottom of crock pot. Add 1/3 bacon, 1/3 onion, garlic, bell pepper mixture, and 1/3 cheese. Repeat layers ending with cheese. In a large bowl, mix eggs, milk, dill, salt and pepper. Pour over ingredients in crock pot, cover and turn on low. Cook for 8-10 hours. YUM! I'm adding this to my recipe box right now! You always have the best recipes on here! Should the crock pot be on high, low, medium for the 8-10 hours this is supposed to cook?